Is anyone else running into audio/video popping when using a Suncom Tac2 with a Sears Video Arcade II? It only happens when I press the orange buttons on either side of the controller. The 4 switch woody 2600 I have has no issues with it. I wonder if it's a power/feedback issue with that specific model. It's kind of comical to watch the screen jump and audio crackle in Berzerk every time you shoot an alien. Also the regular Atari controllers (cx-40?) do not have the issue. I am using a non-Atari branded 9VDC 1A adapter with polarity like (-)-©-(+). Wondering if maybe it's a power issue, although the Arcade II exhibits no other problems with any other devices. There seems to be zero consensus on what the ideal V/A or even polarity or AC/DC should be on these forums and interwebs for this console but I do believe it has to have a bridge rectifier if it can handle both VDC and VAC adapters. I just got this unit with the Tac2 over the weekend locally so I have no idea if it ever didn't do this with the tac2. My guess is it's just the fact that it's a clone that wasn't completely vetted with 3rd party accessories since it was originally destined to be the 2800 in Japan. Edited by montag, Sat May 19, 2018 5:46 PM. You and Jin both expressed issues with your hardware. Probably others as well have experienced these issues. Microswitch joysticks seem to generate a "signal bounce" which disrupts the TIA on select early 6-switch Atari units. Later hardware were not affected. When the microswitch is actuated or released, the signal does not turn on or off instantly. When you view this signal on a scope or logic analyzer, there is not a clean transition from on to off and visa versa, but a lot of noise which lasts for a couple microseconds or so. The TIA reads directly from the paddles, Fire buttons, and difficulty switches. The CPU reads from the joystick inputs. The Fire button connects directly to the TIA with little to no buffering, and the TIA momentarily outputs garbage on random scanlines correlating to the exact instant that the button is pressed or relessed. What is not affected: Controllers with dome contacts (ie vintage cx-40 joysticks) or rubber/silicon carbon dot membranes (ie modern Atgames replacement joysticks), vintage or custom 7800 controllers with inline resistors for two button support. Genesis controllers. Later revisions of Atari hardware. What is affected: Direct wired 2600 controllers with microswitch joysticks and buttons, vintage 3rd party sticks consisting of a bare metal shaft which contacts "leaf" actuators (ie tac-2), when paired with certain revisions of 6-switch Atari systems. I have proposed a mod [untested] which may fix the issue on affected consoles by connecting a small value ceramic disc capacitor between pins 6 and 8 of the joystick port. I don't know what range of values might work but my educated guess is to start in the tens to hundreds of picofarads ballpark and increase the value until the problem resolves itself. Signal bounce should only last a couple of microseconds on a quality microswitch with snap action, so a smaller value would be preferable. Too large (ie greater than around .1uF) and it will take some time for the cap to recharge against the pullup resistor inside the console, resulting in the button input being sustained for a longer duration than the actual button press. This is only a theory at this point, but I have a gut feeling adding a cap over the fire inputs inside the console may suppress any unwanted signal bounce. Other than that, I'm out of ideas. If someone wants to loan me their console (that exhibits the TIA glitches when using a joystick with microswitch fire button), I can try this idea to see if it resolves the issue. I've literally got piles of custom built jousticks to test with. For testing purposes, the capacitor will be added across the joystick Fire button. If it successfully suppresses the graphical artifacts, I will install it inside the console, for free, with owner's permission. The fix will be documented in a video for others to perform. I will even pay return shipping. Great write up. I may do this in the future. Are you in the US of A? Midwest? The 2800 (Sears) so far is the only system that I can get to do it. When you say early 6 switch is that only the heavy sixers or the light sixers as well? I have a light sixer sears (2600) I might try with the Tac-2 to see if it exhibits the same issue. Interestingly the 2800 came out after the 4 switchers (I think? could be wrong) so you would think they would have made the fix on it as well. I just tried Berzerk on the 2800 with a Wico Command Control and it initially created the same signal bounce, except it's much more subtle, but only when using the button on the base (not the white button on top). Actually as I played longer it seemed I was unable to reproduce the signal bounce and it worked perfectly, although when I initially turned the console on it was extremely obvious and the button actually didn't work consistently. The controller has been in a garage or somewhere dirty and almost assuredly hasn't been used for 20 years (not sure, just bought it) so maybe there was some dirt or corrosion in the microswitch that was causing the issue that became dislodged as I used it. Edited by montag, Fri May 25, 2018 10:26 PM. Something just occured to me. I've been giving it some thought. My 4-switch "sparkles" every time I hit the reset and difficulty switches. This is likely due to contact bounce, though spraying the switches with contact cleaner did lessen the effect. Sometimes the select switch in particular will register multiple hits. Annoying if I'm scrolling through the 112 unique variations of game X and skip over the one I want. Could this be the same issue? I believe Jin had a light sixer so it's plausible both light and heavy models are affected. Perhaps a "desparkle" mod would be as easy as placing a cap over the switch? A lot more units are affected by sparkle, though the symptoms are different, both have graphical artifacts that occupty random scanlines basdd upon the position onscreen as the tia races the beam. Another reason why the cap over fire button (pin 6) especially needs to be as small as possible. A debounce cap will extend the logical release of the fire button by some small but measurable amount of time, possibly a few scanlines. Normally this would not have a negative impact on player usage of the fire button when the contact only gets polled once per feame. However some accessory controllers may be timing critical. The keypad controller uses the joystick lines of the cpu in write mode rather than read. The four joystick inputs are alternately activated in a serial fasion. Meanwhile the TIA reads data simultaneously off of the fire and padle pins. The paddles are pulled high by a pair of pullup resistors connected to vcc. If the cpu writes a low logic signal to the joystick port while one of the buttons is pressed, then the tia will intercept a low logic at a specific time, reading the keypad matrix. Why is this important? Well any input caused by charging or discharging an antibounce capacitor will result in time shifted readout of the fire pin 6. This may be long enough time shift to cause the column of buttons corresponding to fire not to register or register improperly. Granted this is all currently untested but the potential is presdnt to interfere with any reading algorithm that uses fire to send actual data rather than button press. Trakball and Atarivox use fire only fire button input so they should be unaffected. Iirc atarivox doesn't use fire for communication? That leaves only joystick which is not timing critical, paddles which don't use fire at all, and I have no idea which pins the lightgun uses, but it is the most time sensitive device of all. Also I havdn't the foggiest notion what the baud rate is on keypad games, but it could very well vary from game to game. Needless to say I haven't worked out what effect if any an extended fire signal input would have on accessory controllers. And fyi I live in Louisiana (deep south). I would need to source a supply of assorted ceramic caps to test if a fix was available and what impact it would have on the keypad controller. I would not want to install anything that might break compatibility with obscure accesories. The problem was fixed by changing the original rf cable to a modern one. 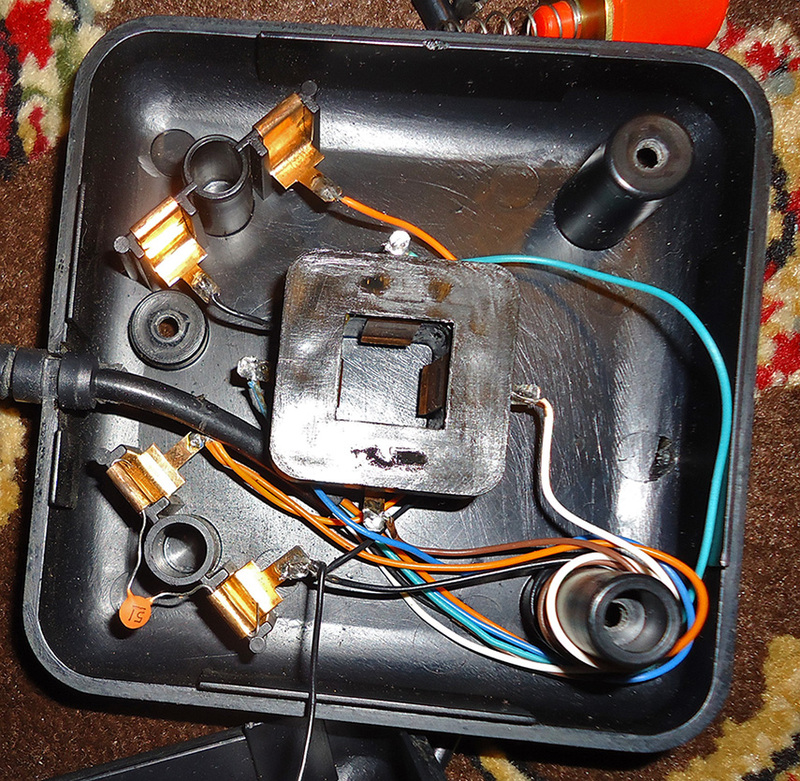 I had to mod the cable slightly, cutting off some of the plastic around the connector with a sharp blade so that it would slide all the way into the Atari. The rf cable on my Atari came with a thin composite cable (yellow tips) when I got it, possibly not even shielded. It seemed the previous owner did try to replace the stock cable, but ultimately the noise problem was caused by a bad chicklet cap and regulator. Internally I added a gold plated right angle RCA/Coax adapter (had to saw part of the tip off because it was too long) and a 1 foot RG59 coax. I clamped a large ferrite RF choke over the 1 foit Coax, then drilled a 5/16 hole in my shell and installed a gold plated RF coupler. I added a drop of superglue to secure the coupler to the shell and prevent the lock nut from loosening, and now use standard Coax externally like you would hook up a vcr. On a CRT, it makes the games looks like an arcade monitor, albeit with about a halfpixel width of rf ntsc color bleed. On my tcl 4k uhdtv, you can see a lot more noise artifacts, but it seems to upscale the240p quite well with nearly no discernable lag. The picture from that Atari, paired with a crt, is probably the best you could get without performing a composite mod. My 7800 is av modded by best, and all my other nintendo/sega/tg-16 consoles support composite natively. For the Turbografx, I bought a 3d printed composite adapter for the expansion port. Works like a charm. I'm still not entirely sure why micros caused artifacts and dome contacts don't, or why a cleaner rf cable might fix it. My hypothesis that it is caused by contact bounce is still just that: a hypothesis. I may still put small caps on my contact switches to see if it desparkles the output. I found this thread because I was having the same problem with my Tac-2 and 4-switch 2600. I thought your capacitor idea was interesting but I wondered if maybe it would be easier and better to put the cap inside the joystick itself instead of modding the console, so I found a small cap and temporarily placed it across the contacts for the left fire button. Maybe it's just a placebo but it seems to have had an effect, the sparkling and interference is almost completely gone now. It couldn't be that simple could it? Vintage dome switches contain two plates of conductive metal placed in close proximity which may act as a tiny capacitance. Pressing on the dome bridges the connection by completing a circuit. Modern microswitches as well as vintage leaf switches lack this effect. Carbon dots like the NES pad or the Atgames joysticks have a small resistance (tens of ohms) as well, so they may be immune. Mind I ask what value cap you used? .1uF? A series resistance (or even the internal resistance of the console) combined with a small cap across the button will essentially create a "latch and hold" effect. The cap instantly discharges upon contact, then continues to conduct for a smallish time interval (less than one frame) after release. This virtually eliminates contact bounce, which may be the culprit for audiovisual artifacts produced by some tia chips but n pit others. Remember, the fire button and paddles connect to the tia. The stick connects to cpu inputs. So I don't think it's a placebo effect. My Atari isn't affected by this bug so I couldn't test it. Thank you for your independant verification. Putting the cap on the controller port is convenient if you have multiple sticks, though it could potentially interfere with keypads, atarivoxes, or other device that are timing sensitive or bidirectionlly communicate with the controller port. The one he has used is a 51 pF. Your idea of a .1uF is a much better one. Yeah it is just a random one I pulled from a parts bin to see if anything improved, but I will look for a .1uf tomorrow and try using it instead. .1uF is the maximum you would want to use. Beyond this point, plugging a controller with more than .1uF could cause vcc levels to droop, potentially crashing the console. 8bitdo adapters will sporadically reset the nes when hotplugged because the intush current is too high. But the cap is connected across a switch, not a voltage rail. Bigger issue is the switch has an input impedance on the console. I do not know what the input impedance is on the Atari, but too high a cap value will make the switch act like a one stop, holding the input for multiple frames. So a .1uF cap connectdd to a 60k input impedance (i am guesding here) will have an rc time constant of ~.006 seconds. One frame is 1/60 sec or .0167. Now, an rc time constant is the time required for an input to reach 63% of it's final resting value. The threshold for most 5v logic is typically 2.4v or greater for high and .8v or lower for low. The intermediary area is a fuzzy logic area outside of normal operating parameters that could result in the chip bein GB unable to reliably detect a logic state. In layman's terms, the exac TV moment of logic transition is unknown. Since the logic is normally high and becomes pulled low, the cap will gradually fill up to 5v potential. 2.4v is 48% of vcc, less than 63, so the time will be shorter than .006 seconds as and significantly shorter TV han ok one frame. Suppose the input impedance is 10k or less, you are looking at less than 1 millisecond hold time after releasing the fire button. In short, a 1uF cap isn't going to cause noticeable delay of inout, but larger values will. And it's a common filterr cap size gor protecting logic chips from load transients. Luckily I did have some .01uF caps and I think it did improve things even more, and you're right it is definitely not a placebo affect. There's is a big improvement and it seems to have gotten rid of 99% of the static at least with the fire button. I'm getting static from the joystick as well so I may try adding a cap to it. I saw you also mentioned getting static from the switches on your 4-switch model; mine were really bad. Bands of static all the way across the screen when I used them and they felt really rough, almost sticking sometimes. I actually desoldered and removed all four of them and took them apart. The little contact springs were almost black with tarnish and there was something sticky in them, maybe some kind of spray cleaner someone used once. I soaked them in hot water and then rinsed with alcohol and got rid of the sticky stuff, then polished the contacts until they were shiny. When I put them back together they worked really smooth and the static issue was greatly improved, but not cleared up completely. The momentary switches still produce some "sparkles" on the screen. I'm wondering if the old capacitors in the console might be causing some of the issues and if recapping it may solve some of them. My light sixer has never has had any noticeable interference problems, not even with my Tac-2. Seems like later console revisions would make things better instead of worse, but I suppose there was a lot of cost cutting involved as well. Maybe getting rid of all that heavy shielding for one thing. Anyway I'll keep working with it and see how it goes, thanks for all the informative posts! Yeah the switch issue is contact bounce on the slider switches. I get a lot of "sparkle" when I slide the contacts, which is a bit different from the lines that Jin showed me in his video a couple years ago when I built him that custom wire harness. I did order a set of factory stock switches from Best Electronics in 2014, but never got around to installing them. The solder mask on the old pcbs is so thick I'm afraid of scorching the board with too much heat if I try and tune the iron hot enough to melt it. I have a cheapo bulb desolder iron from Radio Shack but it's junk and the tip is almost gone. Probably safer to just cut the switches with wire clippers and remove one leg at a time. Or I may just see if I can get a baggie of .01uF caps. .01uF seems like it would be a good number to use. We don't really need whole milliseconds of hold time for a bounce that disappears within microseconds. Honestly the sparkle effect from contact bounce doesn't bother me much, though it can be a nuisance if I'm trying to select say variation number 53 our of 112 and it skips straight from 52 to 54. I am so glad most Batari Basic and Melody enhanced homebrew games larger than 8kb now use text menus so I don't have to look up a long list of variations or difficulty switch settings.